Also, I can’t believe it’s over. Again. Sads. Don’t mind me, I’m just going to be over here in the corner, rereading all the books and pretending Harry Potter is never going to end ever ever. Anyways . . . it was great to see everyone’s reactions to the characters and events of the series. I’m always fascinated by the way that two people can like the same book, movie, or TV show for completely different reasons (for example, Ashley and I love Fringe, but for the totally opposite reasons). And, when you have something with as much depth as the Harry Potter series, the range of thoughts and feelings and reactions is breathtaking. I, for one, was a bit too old to really focus on the coming of age aspect of the series. For me, it was all about the Hero’s Journey, about people coming together and using their special skills to battle the forces of evil. Okay, okay, I may have gotten a little giddy during the Hermione/Ron and Harry/Ginny stuff. I’m only human! Of course, about a week into the re-read, I was handed a giant project that ended up eating most of my free time. This means I wasn’t able to keep up with the posts and comments as much as I would have liked. So, fair warning, expect a lot of posthumous comments over the next few months. There aren’t many books that can stir up this much love, passion, excitement, and controversy. Honestly, the only other book that I can think of off the top of my head would be the Bible. Not that I’m comparing Harry Potter to the Bible, but hell, someone does die for everyone and comes back to life. Just saying’. So why is this series so special? Is it because of the characters and how they are so instantly relatable? Is it the wizard world that JKR so exquisitely created that we so desperately wish it actually existed? Is it the themes of good vs. evil, prejudice and tolerance, growing up, love, or overcoming ones fears? Is it what Ashley touched on in her final post- death. We all will die, and some are more afraid of it than others. Perhaps it’s something different for everyone. I truly don’t think I can explain the exact reason I love this series, and the above explains a lot of it. But I do want to touch on the death theme momentarily (yes, I’m stealing from Ashley but I have so many feelings about death I have to talk about it). I have seen many people die. I have literally watched people take their final breath, their heart beat for the very last time. Sometimes it’s a peaceful process- it’s accepted and welcomed by not only the person who is dying, but those that surround them. The after is sometimes unknown, sometimes fully realized. There is often fear, but after the fight that is life, it is often like Harry in the forest- going willingly, loved ones guiding the way. More often, I put off death at all costs. I assist with placing devices that keep hearts and lungs pumping, I manage machines that oxygenate and pump blood or take over the work of the kidneys, I pound on chests, I shock hearts, I titrate drugs that keep people somewhat comfortable, in homeostasis, and sometimes merely alive. These things that I do are not without consequences. Medicine is not perfect and there are usually complications if one is sick enough: strokes to the brain, clots to the lungs, loss of circulation to legs and arms, bleeding, infection, loss of mobility, loss of quality of life. Sometimes the surgeon is afraid of death, sometimes it’s the family. Sometimes these truly ill people survive. Sometimes no matter what we do, they will die. Voldemort split his soul into so many pieces he became inhuman. He was so driven by his fear of death he became something that wasn’t truly living. All too often I see people end up alive but not living in a very literal sense. I can tell you first hand that fear is suffering, not death! When welcomed like an old friend, death can be peaceful. A wise old man once told us that death is the next great adventure. We don’t know what’s coming, and maybe that’s the scary part for us all. But there is a nasty little place between life and death. Perhaps it doesn’t involve being intubated on ECMO and CRRT, paralyzed and sedated, with dead legs that will probably have to be amputated. But maybe it involves not loving, not doing what makes your heart sing, not living in the moment, not fully enjoying every part of this horrible and wonderful life that’s been given to us. That place is worse than death. We all will die- maybe tomorrow, maybe in 80 years. But what’s the use of living if we spend our days like Voldemort? Thank you all for your words these past months. It’s been a joy to relive this story with all of you. Looking forward to the next time I get to experience the world of Harry Potter! I’ve said this multiple times, both here and on Twitter, but this has been an amazing project for me. It’s been the kick in the teeth to get me back to writing regularly, and more importantly, it’s brought me a bunch of new internet friends. Sharing this with all of you has been phenomenal, and having you share your thoughts with me has made this into – and this is true – the absolute best Harry Potter experience that I’ve ever had. This has been even better than binge-reading the entire book on release day so that I could discuss it with my friends; it’s going back at my own pace and discussing it with all new people. People whose writing is extraordinary, whose experiences I’ve now lived vicariously, and whose perspectives have cast this beloved treasure of a series in an all new light for me. Thank you for reading with me. A+, would collaborate again. I know I already kinda did a quasi-closing thoughts blurb on my last post for Deathly Hallows, but I also wanted to contribute to the official last post, so here I am. Thanks muchly to the wonderful Ashley for organizing all of this madcap blogging nonsense and inviting me to contribute, to my fellow bloggers for being awesome, and to all of you playing along at home. You’re rad as heck. But thanks most of all to Jo Rowling for penning it all in the first place. I’m honestly not sure where I’d be without this wonderful world and the characters within it, so thank you. Rereading through Harry Potter and having to think about it and digest it and explain my thoughts and responses to it has really only cemented the fact that it really is my favorite book series. It’s such a fundamental part of who I am (past, present, and I would assume future, but hey, next year is 2015 and we haven’t gotten hoverboards yet, so I could be wrong), and it was really nice to get to explore and rediscover that with everyone else. I was a very avid reader from a really young age, but a lot of people I know have said that Harry Potter is the series that got them into reading, which I think is one of the most magical things of all (yeah, I went there). I know I’m probably not the only one who has a plan on how they’re going to introduce their future kids to the Harry Potter series. But honestly, I haven’t done an awful lot of reading since I graduated college a few years ago, so in a way this has helped kickstart me back into reading, which I’m also thankful for. I had a lot of fun (even though it seemed like I was crying most of the time, but that’s beside the point!) and this was a great idea, so thanks again, everybody. I’m not entirely sure what else to say, so live long and pr— no, wait. Ah, hrm. Umm. Awkward. Ah, the Epilogue. The point where we get to see everyone living happily every after in slightly disturbing old people makeup. Finishing this series was so sad. Remember that moment, when you knew it was all over? Sure, it ended happily enough, at least for our trio of protagonists and most of the Weasley family, and I was so thankful for that, but I knew there would be no books coming afterward. Such an important chapter of my literary life had closed. Of my actual life. I have never laughed or cried more through the adventures of such great fictional friends, fictional role models, actually. They are also the most re-readable books on the planet, as my completely losing track of how many times I have read them should attest.So, with all that in mind, I want to thank my fellow bloggers for helping me relive this experience with people who GET IT. Thank you for getting it. Thank you for your comments, debates and conversation. Thank you for thinking about things, and not dismissing any of my theories or questions or fancies as silly, but joined in wholeheartedly. This has been truly awesome. Thanks especially to Ashley, for setting all this up in the first place and inviting me to join in. It’s been just too much fun. Oh geez, how do I condense nearly fifteen years of adoration for Harry Potter into a single paragraph? I’ve spent over half of my life thinking about Harry Potter on a daily basis. The story is engrained into my neural pathways, pounded through my veins, and contained in the cells that make up the structure of my very being. And what a tale to build upon! After all this time, I can say that Harry Potter has made me a better person and by that I mean both the series proper and The Boy Who Lived. Harry, Ron, Hermione, Ginny, Neville—these lion-hearted individuals and so many others have guided my actions to choose bravery and kindness and selflessness over cowardice and cruelty and greed. Sure, they’re just stories in the end. But stories matter. Stories change lives. Harry Potter changed mine. When Ashley asked me to do blog posts for a Harry Potter re-read project, I jumped at the opportunity to re-read what I call my favourite novel series ever. It had been a few years and I was excited to revisit. What I found was a series rich and deep with meaning. I find I hold Harry Potter up to an impossible standard. I compare it to Star Wars. I compare it to Dickens. Star Wars because it totally changed the culture moving forward (midnight release parties for books, an increased interest in genre teen fiction, movie adaptations of books splitting the final book into two movies) and the way it totally rocked a culture for a generation (Harry Potter is our Star Wars, think about it). Dickens because it’s wildly populist and also quite literary/legitimately good. Because it is literary isn’t it? We’re still talking about it even though it ended seven years ago. We’re still discussing the implications and the themes and the meanings of all the events that happen. It’s deserving of all of its praise and none of its detractors. And it’s worth discussing and thinking about, and being able to be a part of this discourse is truly wonderful. I loved the personal responses, I loved the way this series touched each and everyone’s lives. And I loved hearing those stories. What a tremendous series. What an enduring legacy. And so rightly so. How blessed am I to have been a part of it. How blessed are we all. I have to keep my remarks brief, thanks to the demands of a long work day and an even longer commute, two things that meant I wasn’t as active on the reread as I would have liked. I did enjoy analyzing the books in a way I hadn’t before. 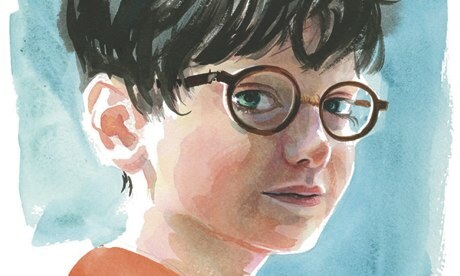 As a fan anticipating the next book, it was hard to step back and look at the themes of the story or examine Harry’s motivations. This project allowed me an attempt at both and it was awesome to look at the story from that point of view. It also let me look into just why Harry’s story affected me so deeply. He’s currently reading Harry Potter. Thank you to Ashley for putting this project together and assembling a wonderful group of writers to talk about the books. I hope to be half as funny, talented, and perceptive as them someday. That’s how I feel about the Harry Potter books. Yes, I know it’s weird to quote another book here, but it’s how I feel! I want everyone I know to read these books. In my personal experience, the people who love these books—I mean love; the ones who know what House they’re in and have thought about what their Patronus might be and discussed the pros and cons of being an Animagus, etc—those are the people I get along with best. We’re all different, but I think we all have this one, intangible, underlying thing in common. I can’t put my finger on exactly what causes it. Maybe it’s that we’ve all felt like a misfit at one point in our lives, maybe it’s that we’ve all had to be brave when we weren’t sure we could. One thing I know for sure that we have in common is that we all believe in magic. Maybe not expecto patronum magic (though some of us believe in that, too), but at the very least, the magic of books and of stories. We believe that these seven books are portkeys into a world we can’t help but visit time and time again. And this time, we took the trip together! Ashley called us to put our hands on the same portkey and we all set off for Number 4, Privet Drive. We hopped on the Hogwarts Express, ventured the Chamber of Secrets, and joined Dumbledore’s Army together. Along the way we hung out in the common rooms and in the Great Hall; we used time turners to visit our pasts, shared our feelings, discussed the way we were interpreting what was going on around us. We asked each other questions and theorized with one another. We agreed, we disagreed, we laughed, we cried. This reread was such an amazing way to re-experience this series. I learned so much about magic and people and even a little about myself. I know that sounds really dramatic but it’s true! A collaboration project could have been the biggest trainwreck in the history of trainwrecks, but with Ashley as our conductor, we had a much higher success rate than Harry did on the Hogwarts Express. We didn’t even need to resort to stealing a flying car! I really loved this project and I’m honored to have been a part of it. I admire every single one of the people involved; they’re such wonderful writers and thinkers and gif-finders. I hope to work with any combination of them in the future. Well, guys, it’s been a fun ride. I have to admit, when I signed up for this, I didn’t quite know what I was getting into. I didn’t expect life to intervene so much, although I should know by now that it always does, with its new jobs and weddings and things I have to do that seem to always be in the back of my mind. Some of my posts came out not quite as good as I would have liked due to time constraints, and throughout this re-read I found myself wishing I was that middle-schooler or that high-schooler again, with no real responsibilities and plenty of time to fall right into Hogwarts. But this re-read also gave me a chance to kinda sorta BE that middle-schooler and high-schooler again. Each time I sat down to write, I not only re-read and reconsidered a beloved book series with which I grew up, but I also relived a part of the person I used to be. I know it sounds cheesy, but I swear it’s true. There’s value in going back and revisiting the things we love. It makes us remember where we came from and what shaped us into who we are. Entertainment has had a huge impact on my life and the way I think. I’m convinced that so much of the entertainment I’ve consumed has made me a more intelligent person. Harry Potter is a part of that, and it’s also a big part of what made me a reader and what made me want to be a writer. One thing I’ve learned from this re-read is that I’m in good company. My fellow re-readers: you’re all fantastic writers and fantastic Harry Potter fans. It’s been a pleasure and an honor. Now let’s all go have some Chocoballs to celebrate! Aw, I love you guys. Ashley is our Harry Potter. This blog is our Room of Requirement. And we’re all members of Dumbledore’s Army. OK, Valerie Anne made me feel too many feelings STOP IT RIGHT NOW. So I just discovered this reread blog and binge-read your posts on the whole series and absolutely loved it. You are all so witty and insightful. It was amazing to find a group of people who have Harry Potter written on the hearts and souls the way I do. This series has always meant so much to me, and your reread blog just brought it back to life. Well done, all! If you ever do another reread blog of another book or series, I am on board!